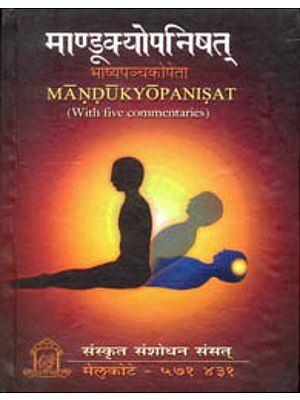 One of the important projects of the Academy is to publish the critical editions of major Upanisads in Sanskrit, Kannada and English with available commentaries. So far it has brought out in Kannada Isa, Kena, Katha, Prasna and Mundaka Sanskrit Isa and Kena English Brhadaranyaka. Upanisads are a vast storehouse of insightful, spiritual knowledge and rank high in Indian literature, and indeed in world literature. Profound philosophical principles are deeply embedded in them and to understand their hidden meaning is indeed a daunting pursuit. The texts are beautifully constructed in orderly poetry, but the enchantment of the structure belies the difficulty of probing the contents within. The great Acaryas had the intellectual and spiritual power to delve into the true meaning of the Upanisads, and their commentaries lead us by the hand, as it were, into the hidden mysteries. These commentaries are a valuable part of our heritage and they cannot, we feel, be disseminated wide enough or often enough. 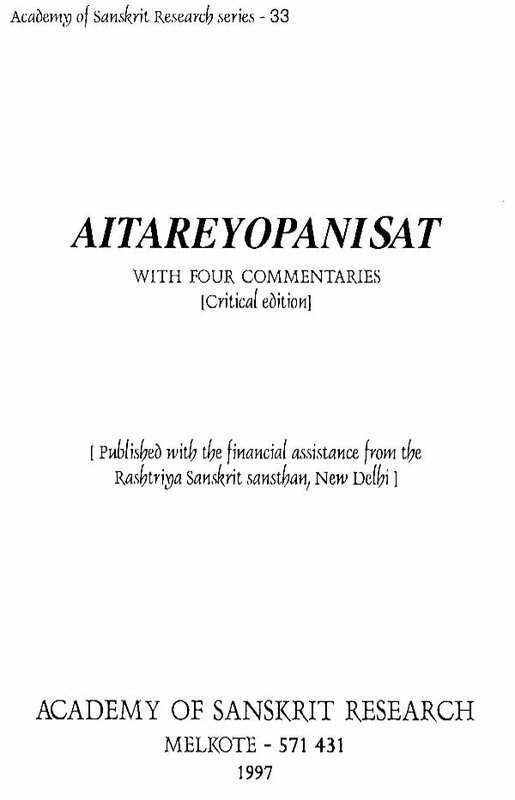 We are glad to place the critical edition of Aitareyopanisad in Sanskrit in the hands of readers. Among the Upanisads, it enjoys a special place as it goes into not only matters of the spirit but also the concepts which pertain to the biological and material world, which now-a-days are subjects of investigation on the frontier of science. For example, did the cosmos begin with a Big Bang or an oscillating Pulse? The grand opening stanza of this Upanisad is relevant to this question but presents a speculation of its own on it. As scientific Cosmology delves further into the mysteries of Creation the Upanisads conjecture will always be there as a parallel line of thought. Likewise, the Upanisad has interesting speculations which have parallels in human biology. In one later section the Upanisad mainly deals with the constituent elements of the human being. The abode of experience (Bhogayatana) is distinguished from the instruments of enjoyment of experience (bhogopakarana), which are needed to experience pains and pleasures according to one’s own past deeds. Both of them are distinguished from the enjoyer (bhokta) i.e. the individual soul which enters into the physical body. But the mere presence of the individual soul (jivatman) in the body is not enough to experience the pains and pleasures. The presence of the Supreme Brahman which also enters along with the individual soul is a vital necessity. This is a beautiful conceptualisation of the Supreme Brahman’s immanence in all beings; and it has also a relevance to the world of biological phenomena. Though this Upanisad is small in appearance, it has its own distinguished place among the ten principal Upanisads. Not only does it provide food for thought on the Universe and creation of the world around us, but it also lays down the means for the emancipation of the soul. On a pragmatic level it narrates the efforts of Vamadeva, a great sage who attained salvation after meditating upon that Supreme Consciousness which, as the Upanisad says, is all pervasive. To enlighten the readers on the substance and significance of the Aitareyopanisad as well as its history, Prof. K.S. Narayanacharya has favoured us with a vivid introduction. We are very grateful to him. A special feature of the Sanskrit publications of the Academy is that we have made it a point to include a detailed introduction in English in them. Our thanks are due to the Rashtriya Sanskrit Sansthan, whose monetary support made this publication possible. We are grateful to Prof. M.A. Lakshmithathachar for the excellent guidance and leadership he has given to the scholarly team responsible for this volume. 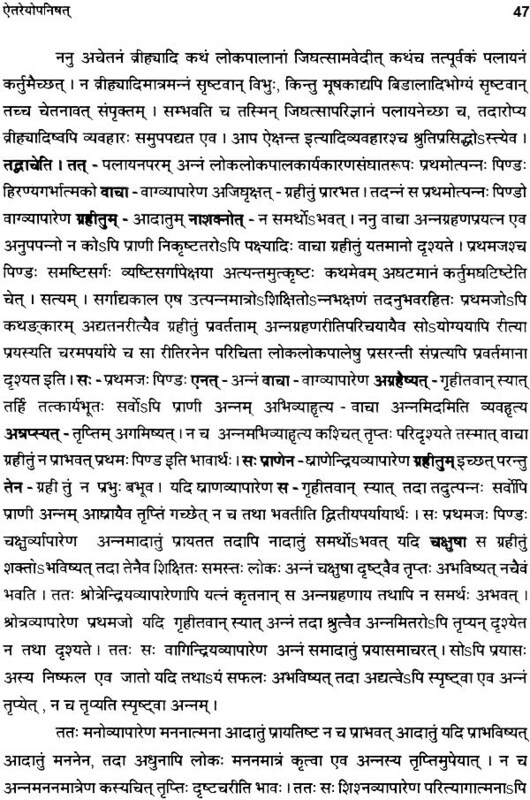 Academy of Sanskrit Research is bringing out various critical editions of the basic vedantic texts for the last 19 years. So far we have covered Sribhasyam and Vedarthasangraha among the nine works of Acarya Ramanuja and five Upanisads in Kannada, two in Sanskrit and one in English. 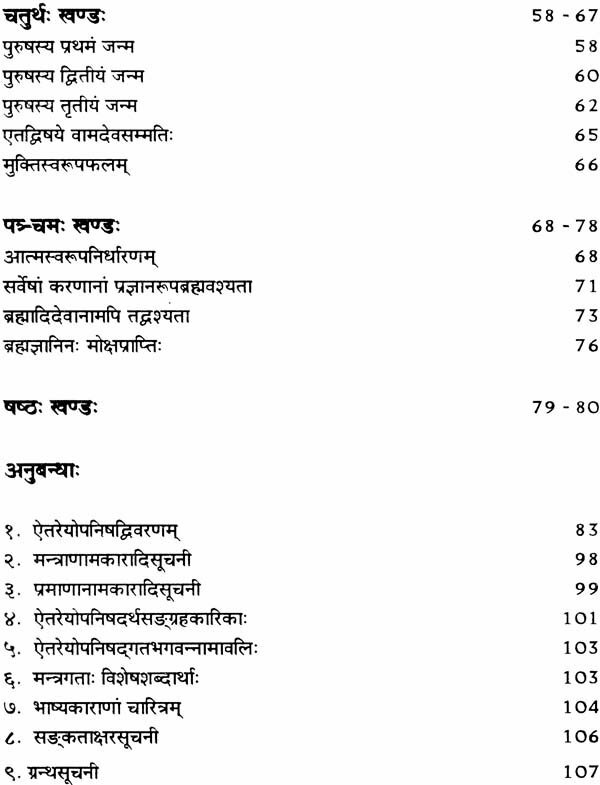 The Sanskrit editions of the Upanisad series are designed as follows: main text in Devanagari, authoritative text of the available . commentaries in original, supplemented by Academy’s notes wherever necessary. The commentaries presented herein belong to, or are allied with, the school of philosophy propounded by Acarya Ramanuja. It is our hope that by bringing together the main commentaries of the school in one volume, comparative research between different schools of interpretation of Upanisad will be facilitated. Now the Academy is happy to place in the hands of seekers of knowledge the critical edition of Aitareyopenisad. Though it is small in size among the major Upanisads, it occupies very important place in the spiritual field as it deals with the Reality and the means of salvation i.e. meditation, in a unique way. The Upanisad begins with an explanation on the state of the root cause of this universe before creation. Then it deals with the creation. The thought that the Supreme Brahman is immanent in everything, whether it is sentient or insentient, is brought out beautifully in this Upanisad. The main aim of meditation is to obtain a blissful experience. When we discuss about meditation we should also know the object of meditation. It is possible even the individual soul could be meditated upon as it is also in the form of consciousness and its experience is condusive to bliss. 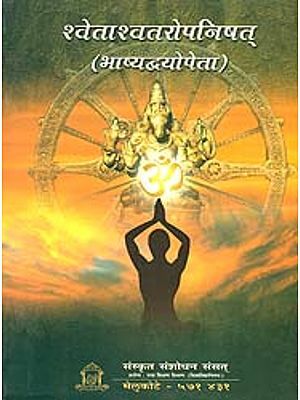 Aitareyopenised says that the Parabrahman in the form of supreme consciousness, who is inherent in all the individual souls, should be meditated upon as this alone can be the means for final emancipation. Parabrahman alone is considered to be the purusa that is the person inhabiting in all the individual souls and he should be meditated upon. This meditation is called purusavidya as the Supreme person Purusa is meditated upon here. Upanisad also refers to the different levels of knowledge of the individual souls as samjnana, vijnana and prajnana. The individual consciousness viz, Prajna which is centered on the Supreme Consciousness alone leads to salvation. Then alone the individual soul gets union with the Supreme Brahman and enjoys bliss. This edition includes the commentaries on Aitareyopenisad Pratipadartha Dipika by Bharadvaja Ramanujarya, Prakasika by Rangaramanuja, Anandabhasyam by Ramananda and Subhodhinl by Gopalananda. Mahamahimopadhyaya Sri Lakshmipuram Srinivasacharya’s commentary Aitareyopenised vivaranam is also given in the Appendix. Apart from this, the appendix includes - alphabetical list of Mantras and pramanas, list of abbreviations, Arthasangrahakarika of Uttamur Viraraghavachrya, Bhagavannamavali, special word meanings, biography of commentators and bibliography. I profusely thank Rashtriya Sanskrit Sansthan for their valuable assistance to publish this work. I convey my deep debt of gratitude to Panditaratnam K.S. 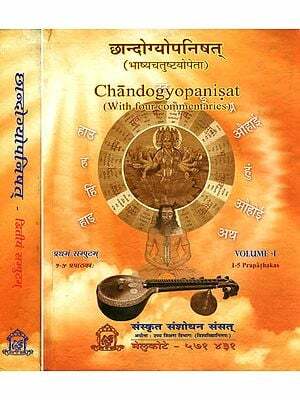 Varadacharya under whose personal care these publications are being brought out. I am grateful to Prof. K.S. Narayanacharya for his vivid introduction to Aitareya which conveys the message of the Upanisad to people at large. Vidvan Vadiraja V. Agnihotri deserves commendation for his introduction in Sanskrit. The scholars and staff of the DTP section of the Academy have put their efforts to make this publication as accurate as possible. I offer my thanks to them. At the end, I thank: the Elegant Printing Works for their timely and beautiful printing. The Aitareya is accepted as one among the ten principal Upanisods and all great Acaryas have either commented on it themselves directly or have caused them to be written by chosen disciples. It belongs to the Rqveda, and constitutes part of a Brahmana by that very name. Only two such Brahmanas have now come down to us, the other being the Kausitaki or Sankhyayana Brahmana, belonging to the Rgveda. Scholars have inferred that there must have been other Brahmana parts belonging to this ancient Veda. Asvalayana mentions in his Grhyasutra, names of a great many numbers of authors and preceptors of this tradition who also figure as Rsis, (men of great penance to whom Vedic verses were revealed), elsewhere in the vast vedic literature. Commentators identify Rsis as those to whom the mantra was revealed, and Acaryas as those who left commentaries called Brahmanas on the mantra parts. The Brahmanas were the first ever comments on the Samhita parts, as accepted by all, in the Vedic literature itself, though authored by and still figuring in the names of individuals. Sayana’s saying that the name Veda applies equally to the Samhita as well as Brahmana literature Mantra Brahmanayoredanamadheyam removes the doubt whether authored literature can be accepted as Veda! This explains why Samhitas generally do not appear appended with any individual’s name, while Brahmanas do ! Another explanation is that the extant Vedic Samhitas and Brahmanas do not, as a rule, have any authorship of any particular individual, but whatever names are appended to them are those of particular recension, branches, as popularised by great Kulapatis, pravartakas, famous recipients of weighty traditions. Whatever may be the merits of these considerations, Asvalayana does mention the names of Samhita Seers and Brahmana developers, as Kahola (who also figures in Brhadaranyaka Upanisad and Mahabharata), Kausitaka (in whose name we have an Upanisad now), Mahakausitaka, Paingya (instances from an Upanisad in whose name are often quoted by Madhvacarya), Suyajnya, Sankhyayana, Aitareya, Mahaitareya, Sakala, Baskala. Sujatavaktra, Audavahi, Mahaudavahi, Saujami, Saunaka, and Asvalayana himself. We do not have Brahmana texts now available in the names of all these seers, and we also do not know whether there were, at all, Brahmanas left by them all, or that we have lost many and have only those that we now know. It is enough that Aitareya occurs in this list to prove its authentic nature and antiquity. The Aitareya Brahmana has forty chapters and is more extensive than the Kausitaka, and is obviously more useful in understanding a good many Rg verses. Every five of these is considered as one unit, called Pancika, and so there are eight such units in all. 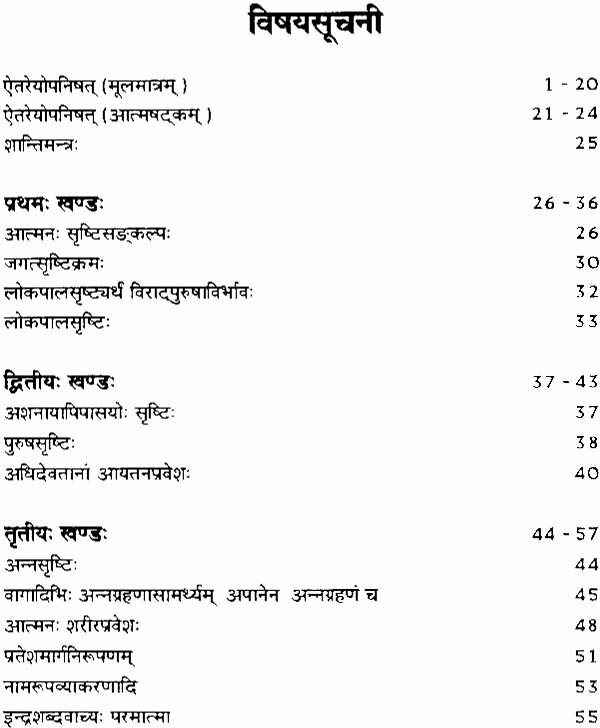 Each Pancika has several parts called Khandas, and a total of 285, (two hundred and eighty five,) such parts are there in this Brahmana their number varying from unit to unit, in this order 30 (in the first), 41 (in the second), 50 (in the third), 32 (in the fourth), 34 (in the fifth), 36 (in the sixth), 34 (in the seventh), 28 (in the eighth), totaling 285. Counted sentence-vise there are about 5700 of them, as this literature is all in prose. These contain ritualistic details of the conduct of Sacrifices like Somayaga, Rajasuya, rules to be observed during the coronations of Emperors, some anecdotes like those of Sunahsepa (later adopted son of Visvamitra) and the names of numerous such crowned emperors and kings. There are also individual views of the author of the Brahmana, his criticisms, explanations of doubted contexts. About dates, it is wise to be silent and say that it is very ancient, perhaps as ancient as the Rgveda itself, as there is a vide divergence of views in this matter between Westerners and traditionalists. That is enough for our purpose here. Our present text of the Upanisad constitutes the fourth, fifth and sixth chapters or parts of the second Aranyaka, coming at the close of the Brahmana part. The Aranyaka itself runs into some 18 chapters distributed over its 5 Books, each of which is called an Aranyaka. 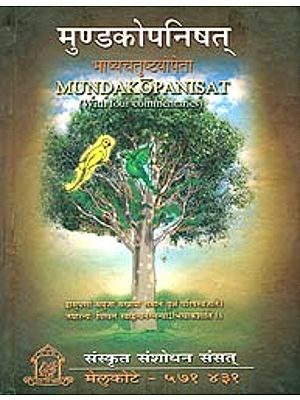 Some count nine chapters in this Upanisad comprising all the seven chapters of the Second book and the two in the Third book, thus including two entire books, the second and the third, in this Upanisad. (Sayana in his Brahmana and Aranyaka commentaries, follows this arrangement). Sankara himself follows the other arrangement, and Sri Ranga Ramanuja, Gopalananda, and Ramananda of the Ramanuja school follow this arrangement only. 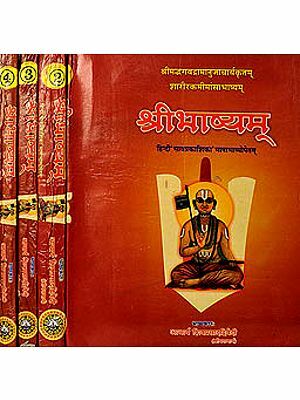 Madhvacarya follows the other arrangement of including 9 chapters running over the second and third books, and his followers call this the ‘Maha’ (The ‘Greater’) Aitareyopanisad. In the present edition brought out by the Academy of Sanskrit Research of Melkote, the generally accepted view of the three chapters of the second Aranyaka constituting the strictly essential Upanisadic parts is adhered to and our considerations are mainly based on and restricted to this idea of the text. Sayana and other commentators point out that a sage by name Mahidasa Aitareya is the promulgater or author of this Upanisad and the entire Brahmana of which it is a part, and hence the name of the Upanisad like its Aranyaka and Brahmana. The name of Mahidasa as Aitareya occurs also in Chandogya Upanisad (III - 16 - 7) and there it is said that he lived for one hundred and sixteen years, by practising the Purusa Vidya, (one of the celebrated thirty two), for all that length of life. The Upanisad says that the first 24 years have to be lived as morning oblation, (Pratassavana) corresponding to the 24 alphabets or syllables of Gayatri metre the next forty four corresponding to the 44 syllables of Tristubh metre and the last 48 corresponding to those of Jagati the second period to be viewed as Madhyandina savana, the Noon oblation, and the third as Sayam savana or the evening oblation thus all life corresponding to a grand sacrifice, in every detail of food, rest and various activities to the ritualistic, prescribed details of the sacrifice.